Morning drive to Hout Bay. It is windy and drizzling, but the view of the costline is impressive nonetheless. In a somber, austere way. On the way the driver stops at a viewpoint and I notice, not far away, a crew of about 15 workers, about half men and half women, huddling under the roof of a delapidated house. It looks like it has been hit by the weather for years, abandoned and now filled with sand. Wet sand now: it looks like it's been soaking rain for a few hours at least. It's an eerie but somehow attractive scene, it could be the stage for a movie by Sergio Leone, were it not for the fact that it does not rain much in his movies. I approach and ask them what they are up to and if I can photograph. 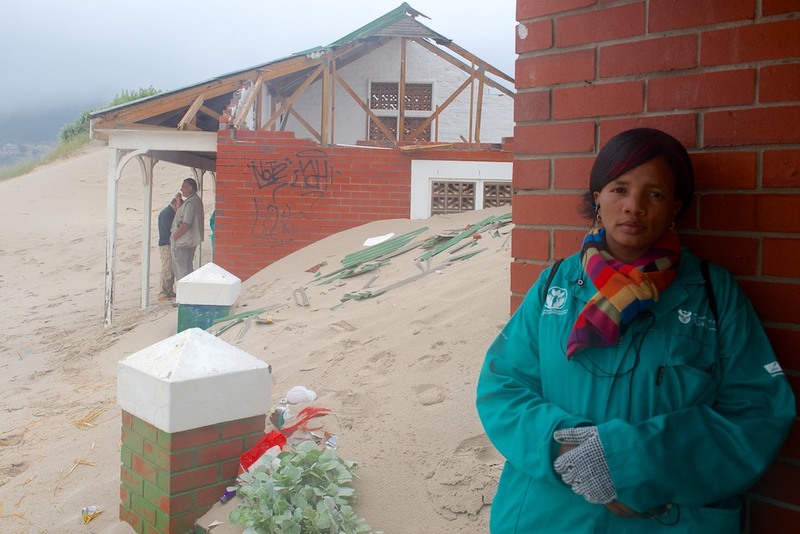 They are there to cleare the scene of sand and debris, but can't work under the rain. The light rain is not so intimidating to me but they have no raincoats. We chat for a while, I snap a few shots of their green overalls against the red bricks of the house and the white sand, and off I go. On the way back to Cape Town it occurs to me that we are close to the Groot Constantia winery, the oldest in South Africa. We have to stop and go for a tasting. As we approach, we drive by the Pollsmoor prison, where Mandela was held after his Robben island years until he was finally freed in 1990. 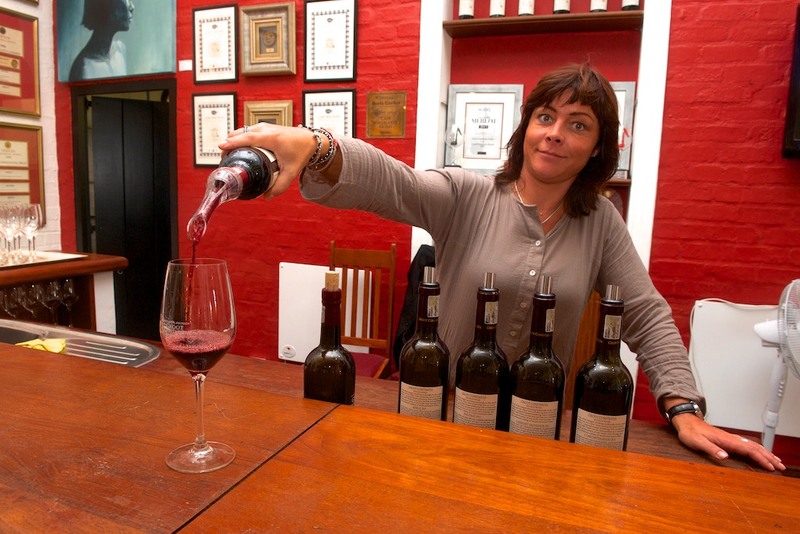 The tasting is fun: for a small fee you can taste five of their wines, and for a little extra cash you get a small cheese platter, nicely served on a small wooden board with a small wooden knife. A white lady and a black man operate two serving stations in the huge tasting room. Lots of tables in the middle allow wine lovers to mingle and take their time as they get the various wines poured into their glasses. We take our time but I keep an eye on my watch: it's not far from town but we don't want to be late to what promises to be the highlight of the day: a township tour with Sabelo, the bright young tour leader who took me and Yan for a music evening last month. I called him yesterday to organize another musical evening (we'll do that tomorrow) and mentioned in passing whether he also organized some visit of townships surrounding the Cape Town. Of course! He is at our hotel at 14:00 hours, punctual as a Swiss watch, with a small van and Daniel, a jovial driver who will be at the wheel for the afternoon while Sabelo explains and shares his vast knowledge of the townhips. He actually does not live here but in another township, which however he does not think is safe to visit, even in his company. The first townships we visit is Langa. It means "Sun" and was built in the 1920s to host blacks evicted from other neighborhoods such as Ndabeni that were too close to rich white areas for comfort. All this decades before apartheid was even formally the law of the land. First stop at Cape Town tourism center in Langa, this township is not as well known as Soweto but it is trying to find its way in the tourism business. Some artists display their paintings and sculptures, musicians who demonstrate traditional music, students study in a reading room. We are kindly offered a music lesson by a drummer. Ladies by the gate, not particularly busy with anything, fun to talk to anyway.I snap some pics of a lady by a wall mosaic and she seems to appreciate the attention. With them, a security guard is listening to some music from the radio. He wears a loose khaki uniform and a red tie, with a badge on his arm that reads "Security - Distinctive Choice". Somehow I find myself in agreement with the general thrust of the idea. Just by the entrance two men in their thirties are exchanging banter and I join them for a few minutes. After the usual questions about Italian football, Totti etc, they tell me a bit about their life. 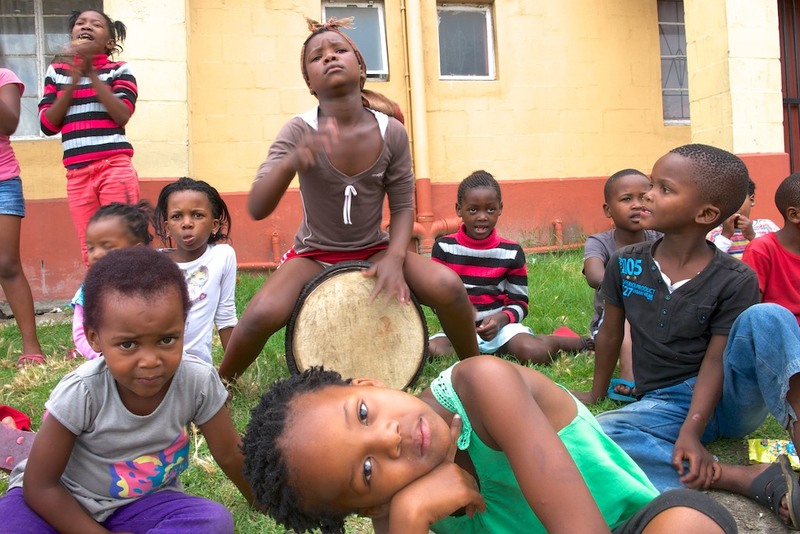 In a nutshell, their message is that they have a normal life, Langa is a normal place with its good and bad, dos and don'ts, happy and sad. Maybe that is the main point I will come away with at the end of the day. 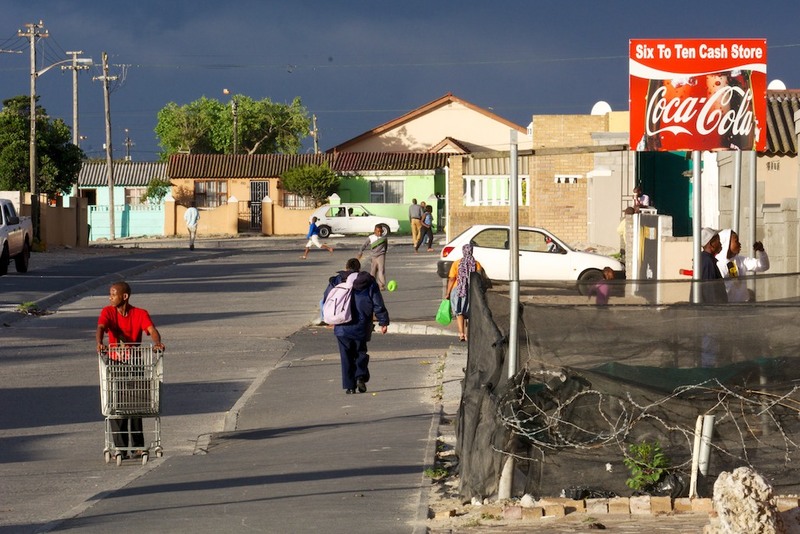 Townships are becoming "normal" places, normal for South Africa anyway. Lots of kids play music of some sort, and I am attracted to an especially photogenic girl with a drum, who plays on the sidewalk surrounded by a couple of dozen children. It's still the school holidays so they are free even though it is a weekday. Outside the visitor center a man with no feet sits quietly in a wheelchair. He does not beg for money, does not reciprocate my greetings and does not bat an eyelid when I ask him to take a photograph. He hardly seems alive. Maybe that is the saddest condition of all, having lost the desire to live. On the contrary, the people I meet as we proceed to walk around the township are anything but. At first I am a bit hesitant, I do feel some emotional pressure as this is the first "real" township I visit, it's not tourist-filled Soweto. But the ice is easily broken. Most people are happy to chat and all kids are elated to have their pictures taken. After a half hour of walking I run into a team of ladies who are busy cooking a whole pile of sheep heads. Yes sheep heads. They sit on a chair and each have a not-so-small fire next to them. They protect the skin of their faces from the heat with some special cream, The heads are cooked and then placed on a large table by the roadside, presumably for sale though I am the only one who comes forward and buys one. I have to try! Well it's good, tender meat, the cheeks expecially. No one else wants to try. Too bad (for them). Next stop is Khayelitsha, a large township of 400.000 people that lies 22 kilometers to the East down the N2 road. The first place we visit is the rather grandly named "Department of Coffee" coffee shop, just next to the large railway station. A micro enterprise by Wongama, a former fire guard and two friends of his who decided to open this shop when they realized there was no place to get a warm drink for the thousands of people using the railway every day and saw an opportunity. They say at first people were sceptical but now business is briks and they are thinking of opening another shop. "CAPPUCCINO" for 8.5 Rand is at the top of their red menu board hanging from the wall of their small bar. Our second stop in the township is at the Velokhaya cycling academy. The word Velokhaya is derived from the French word for cycling (velo) and the Xhosa word for home (khaya) – as such, we’re regarded as the ‘home of cycling’ in Khayelitsha. A school of cycling but also of life, where kids from the townships are offered a chance to develop a skill but also, and perhaps more importantly, personal discipline and a sense of purpose. Co-founder Glyn Broomberg explains in this video. And the other co-founder Amos Ziqubu gives his story. Unfortunately we are still in school holidays so there are no kids training here. 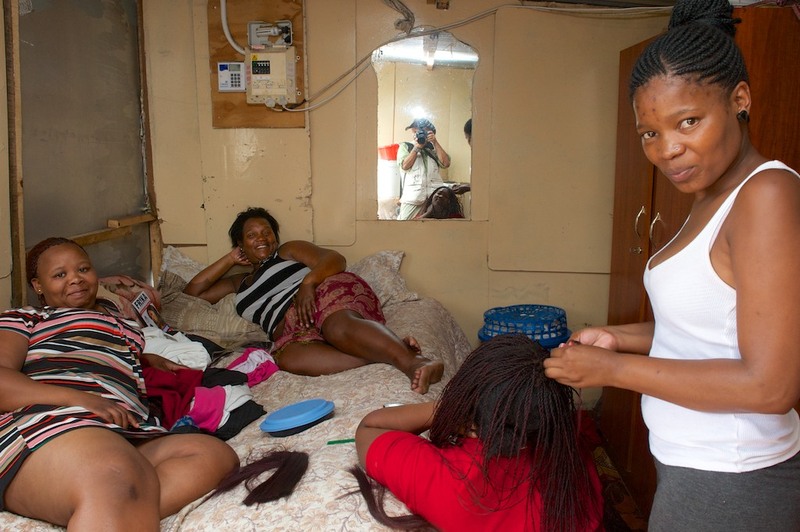 You can understand more about Khayelitsha township in the video "My mother built this house" on housing problems here. See a trailer for the film "A wooden camera" on this township here. 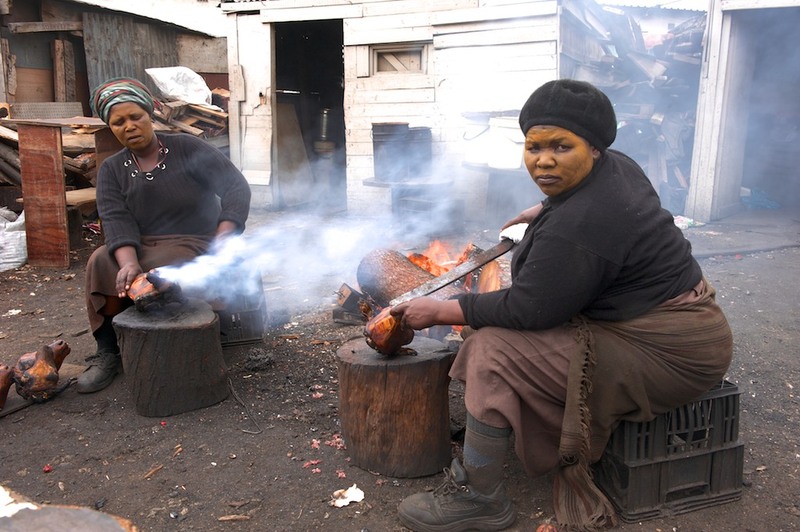 The third and final township of the day is Gugulethu. Here out target is Mzoli's, a butcher who had the idea of not only selling meat but also setting up a huge grill and serving his streaks and sausages to customers who wanted to eat there. 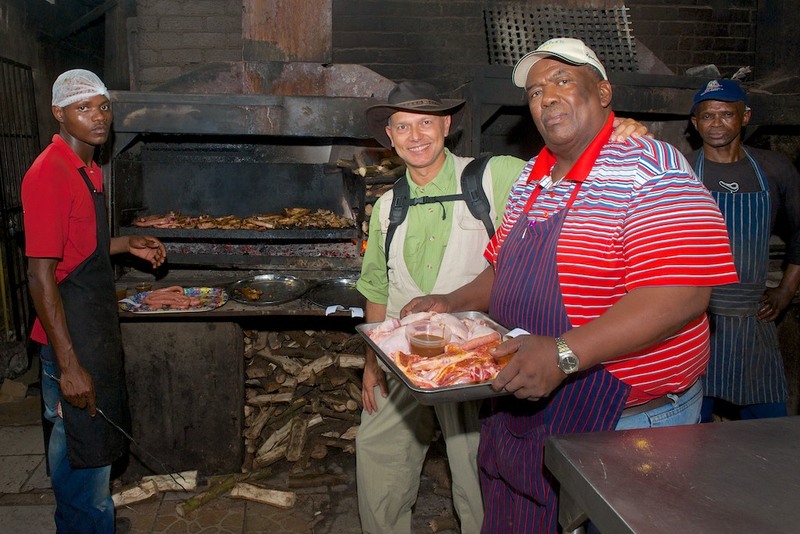 His humble restaurant has become increasingly popular with locals and increasingly with tourists, both South African and foreign. 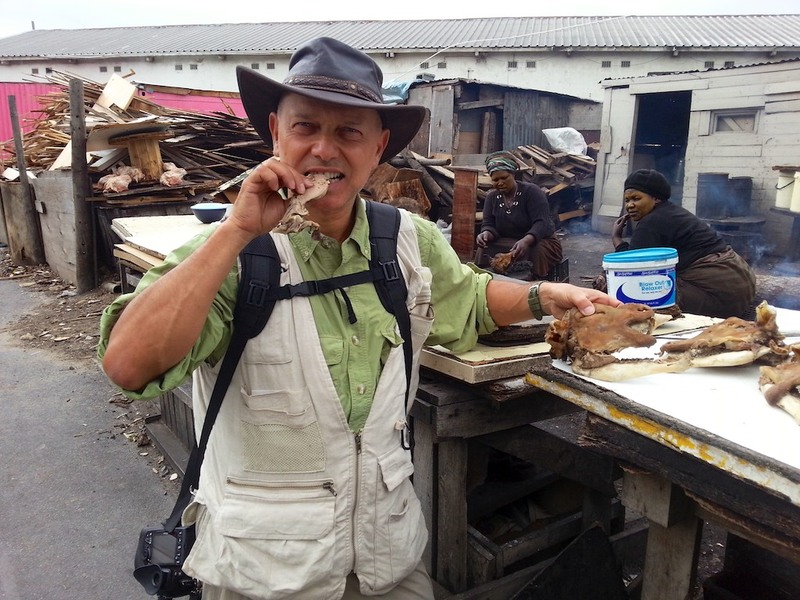 Prices are cheap, the meat is excellent and the atmosphere is warm and welcoming. Music is loud but pleasant in the terrace next to the shop where simple tables are continuously filled with trays of hot meat, but no cutlery or napkins, so I am soon in dire straits trying to juggle sausages and lenses without making a mess of either. No alcohol can be served but Mr. Mzoli has no objections if we buy it next door and take it in. After a while most locals, seeminly regular patrons, are dancing, soon to be joined by the ladies in my group! After such an intense day, what would otherwise have been a pleasant walk and dinner becomes a pretty insignificant evening at the Waterfront.